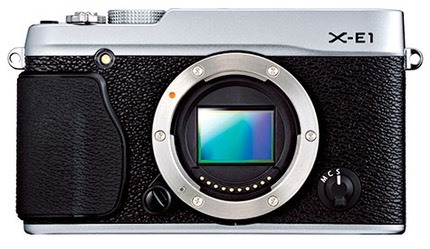 Fujifilm today pre-announced the X-E1, a simplified version of the X-Pro1. In place of the hybrid optical/electronic viewfinder of the X-Pro1, the X-E1 features a higher resolution 2.36m dot all-electronic viewfinder. Other changes include a smaller, lighter body (though still with a magnesium frame) and LCD (2.8" instead of 3"), addition of a small pop-up flash, and a few other minor tweaks. Price will be US$1000, and the camera is said to be available in November. What doesn't change is the mostly dial-based retro user control, the use of the XF mount, and most of the primary internal features of the camera, including using the X-Pro1's 16mp sensor. As with the X-Pro1, video features seem to be mostly taking a back seat: we still get only 1080P/24 at the top end of the video specifications, and video handling is completely ignorable by a still shooter. As the second member of the X series mirrorless cameras, the X-E1 shows Fujifilm is going to iterate in this space, and do so in interesting ways. In this case, they've reduced the X-Pro1 down to about X100 size, but have made it a little more conventional by dropping the hybrid viewfinder. Those who are nostalgic for Yee Olden Dayes, will note that, from the front and top, the X-E1 is pretty much indistinguishable from some film cameras (though you might wonder where the optical finder went). 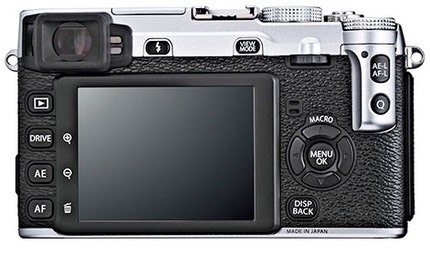 Right down to the threaded shutter release (which will take a mechanical release cable), Fujifilm seems to think that the primary attribute that people are picking up on with the X cameras is the retro style and controls. Perhaps. Certainly, such controls are intriguing to those of us who've been around long enough to have used them the first time around, intriguing enough to look more closely at the cameras themselves. That's usually when the real attachment that some feel comes: high-end Fujifilm digital cameras have long had a reputation for producing attractive out-of-camera results, and the X-Pro1 (and now likely the X-E1) was no slouch there. Indeed, in terms of high ISO work, the X-Trans sensor used in the X-Pro1 and X-E1 is arguably the best of the APS bunch. The X-E1 is said to be faster than the X-Pro1 in focus speed, but that advantage ended immediately, as Fujifilm has applied the same focus strategies in a firmware update for the X-Pro1. While the X-E1 is smaller than the X-Pro1, it's still bigger than the NEX-7 and E-M5 OM-D. Still, the smaller size does put the X-E1 into the game in terms of size. Along with the X-E1 announcement comes the official pre-announcement of the 18-55mm f/2.8-4 OIS zoom lens, which lists for US$700 and the 14mm f/2.8 at US$900. 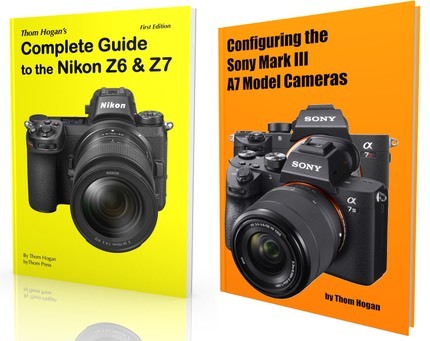 Both lenses are expected to be available in November. A short list of X-E1 accessories, mostly things that need to be different for the X-E1 versus the X-Pro1 (camera bag, an HG-XE-1 "handle", and a new electronic remote release (RR-80) that plugs into the microphone jack, were also introduced. A little hidden in Fujifilm's press materials was the reiteration that Fujifilm expects to have 10 XF lenses in 2013, which is good news for both X-E1 and X-Pro1 users alike. As seems to be a constant problem with the Japanese camera makers, early leaks have pretty much stolen the thunder from the pre-announcement (remember, the camera isn't likely to ship until probably December). Worse still, Fujifilm themselves appear to have let their press release out of the bag at least a half day early. If all this leakiness isn't intentional, it's incompetent. Neither of those are positive alternatives. It's one thing to "tease" an announcement (as I write this Apple is teasing the iPhone 5 announcement by sending press invitations where the September 12th date casts a shadow that says 5 instead of 12), it's another to let press releases with pretty much the full details drift into the press's hands prior to your actually issuing them. Even worse in Fujifilm's case: the Fujifilm Korea site put the X-E1 up on their Web site at least a full 12 hours prior to Fujifilm's own embargo time. How can we trust camera designs, firmware, and more when the camera makers can't even get their own launch marketing even close to right? Is this any way to run a camera business?